Rebate: Up to $1,500 back until July 9, 2019. CLICK HERE for details & rebate. Raymarine’s Ray63 radio comes with oversized controls and a big screen for easy operation offshore. 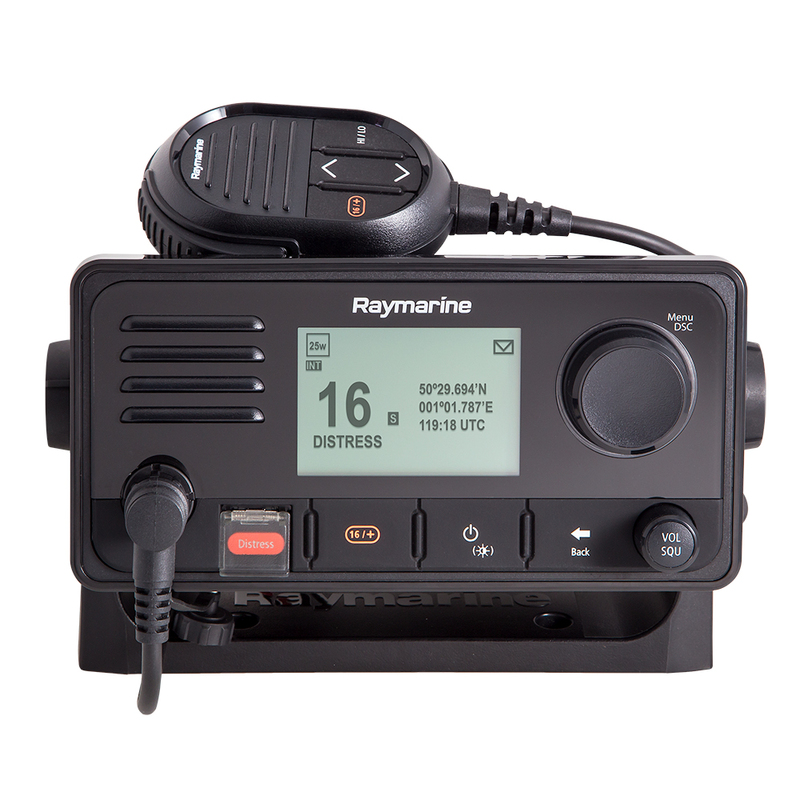 Ray63 is a full-function VHF marine radio with Class D Digital Selective Calling (DSC) and a built-in GPS receiver. Simply program your boat’s MMSI number into the Ray63 and immediately benefit from the enhanced calling and safety features of DSC. The Ray63 supports both NMEA2000 and legacy NMEA0183 networking which enables it to connect with other onboard electronics. Ray63 also supports the connection of an optional remote speaker (A80542) to provide audio at a second location. Ray63 also supports dual control stations with the addition of the optional RayMic second station kit. With an oversized LCD and simple controls, the RayMic is a compact all-in-one handset that fits easily on any secondary helm, tower or navigation station. Use RayMic for station-to-station intercom capability too. Ray63 was designed to comply with the latest international regulations and includes a connection point for an optional GPS/GNSS antenna. The optional antenna improves the GPS reception when the radio is mounted below deck, in an enclosed pilothouse, or inside a metal enclosure. Ray63 features an attractive industrial design that complements Raymarine’s Axiom family multifunction displays. The radio includes both a standard trunnion mounting kit as well as surface mounting hardware.